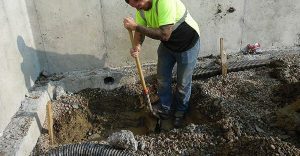 Trenchless sewer repair has been available to residential, commercial, and industrial property owners in the St. Charles, Missouri area for the past fifteen years or so. Nu Flow Technologies has taken it one step further with the development of the trenchless Nu Flow pipe lining process. When most people hear the words “sewer repair” the first thing that they picture is a piece of heavy-duty excavation equipment digging into the ground at their home, place of business, or investment property. Traditionally, excavation was the only means in which a plumbing company could repair or replace the sewer pipeline in the not too distant past. It requires the excavation of a large and destructive trench along the length of the sewer pipeline in order to physically expose the pipes for repair. Typically, sewer pipes run under lawns, flowerbeds, trees, shrubs, mulch beds, driveways, patios, walkways, sidewalks, and parking lots to name a few items. Unfortunately, the trench destroys any landscaping and hardscaping in its path, which of course adds on to the price of the job. Speaking of which, by the time all is said and done the traditional excavation method can cost property owners a minimum of $25,000 or more. Can you imagine putting all of the money into the ground? With our Nu Flow trenchless pipe lining process, you do not need to. Instead of excavation, a large and destructive trench in order to expose the sewer pipeline for repair only a small access point is required. A high-tech machine uses the access point to install a tube into the existing sewer pipes. The tube contains an inflatable air bladder, and a felt covering that is soaked in a specially formulated wet epoxy resin solution. The tube is inflated once installed into the sewer pipeline. At this point, the epoxy resin completely coats all interior surface areas of the sewer pipes. The tube is then deflated and removed. The epoxy resin hardens or cures in place within a few hours, forming a brand new liner or pipe within the old one. The new epoxy liner seals off any chips, cracks, small breaks, and rotten spots contained within the existing sewer pipes. It also prevents further problems from occurring and will last for well over fifty years. Our Nu Flow trenchless pipe lining process takes as little as one day to complete from start to finish and costs approximately fifty-percent less than the traditional excavation method. Why excavate when you can hire Nu Flow Technologies that incorporates the use of technology in order to save you both time and money. Please contact our St. Charles, Missouri location to schedule an estimate or with any questions about the process that you may have.